Forged Fantasy is a unique story-based RPG developed by Hothead Games. Collect dozens of heroes, adventure through fantastic worlds, topple the darkness that threatens the realm. Switch Heroes on the fly during real-time battles. Take charge and control the battle or play Auto-mode and employ tactics. Play through vast unique Realms and hundreds of missions in Campaign Mode. 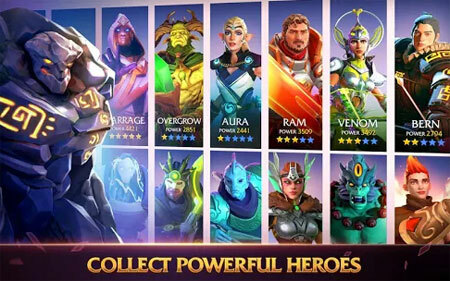 Collect Dozens of exclusive heroes, each with their own legendary weapons and special abilities. Craft the best combination of Heroes and enter a Realm to battle. Win rewards after each final battle, level up your heroes and upgrade your abilities. If you get stuck in the game, check out the video walkthrough and gameplay for the game. This entry was posted in Android and tagged Forged Fantasy Cheats, Forged Fantasy Gameplay, Forged Fantasy Guide, Forged Fantasy Strategy, Forged Fantasy Walkthrough by Marvin Tang. Bookmark the permalink.